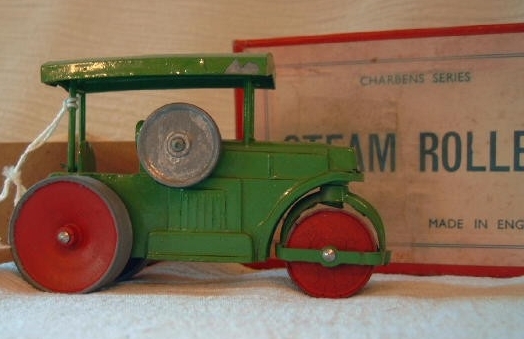 Robert Newson looks at the crude and charming models from this long-running manufacturer. I have wanted to write about Charbens for a long time, but the prospect has always been somewhat daunting. 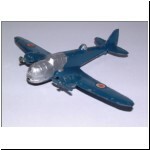 Their production spanned over 40 years but their documentary records are few and some of the models are very scarce. However, since no-one else has attempted the task, I will tell you what I know about Charbens and hopefully readers will write in (or e-mail me) where there are gaps to be filled. 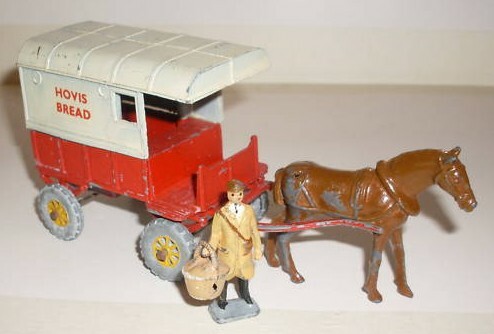 There is also the question of how far one should include horse drawn items, which for many collectors sit more happily with the lead figures part of the Charbens range rather than with the motor vehicles. 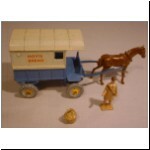 I have included them since they were numbered with the motor vehicles, but I draw the line at including pedestrian carts like the Walking Barrow Boy or the Knife Grinder! 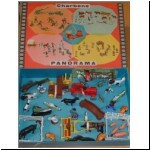 Charbens figures are well covered in the excellent and profusely illustrated book Hollow Cast Civilian Toy Figures* by Norman Joplin and Philip Dean. The firm was founded around 1927 by two brothers, Charles and Ben Reid. It is obvious how they chose the name for their business! 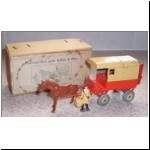 In fact it may have been slightly earlier than 1927, because in the 1955 catalogue they said "We have had the pleasure of supplying the wholesale and export trade for the last thirty years". I managed to locate the Reid family in the 1901 census records. Charles George Reid was then 13 years old and his brother Benjamin was 10. They lived with their parents and three younger siblings at 70 Mitford Road, Upper Holloway (London N19). 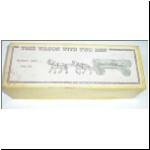 Their father William J. Reid was born in Devon and worked as a groom (looking after horses). It is very likely that Charles and Ben went to work for Britains Ltd., whose head office and original factory was at 28 Lambton Road, off Hornsey Rise (London N19), less than half a mile from the Reids' home. Britains were of course the market leaders in hollow cast lead figures, and it is not surprising that they inspired many competitors. 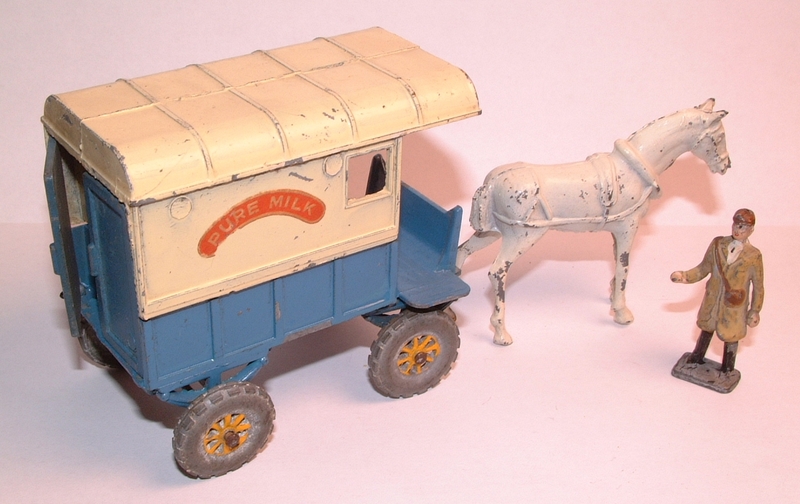 Four of the best known lead figure manufacturers to emerge in the 1920s were John Hill & Co., Taylor & Barrett, The Crescent Toy Co., and Charbens & Co., all based in north London, and no doubt benefiting from the skills of ex-Britains employees. 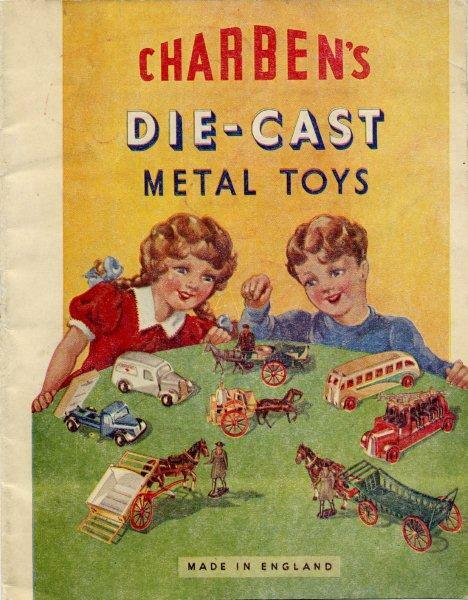 The first documentary reference I can find to Charbens & Co. is in the trade magazine Games & Toys for February 1928, where it was mentioned that Charbens would be exhibiting at the British Industries Fair, to be held at White City. In the March 1928 issue, Charbens took an advert, and their address was given as 34 Mitford Road, N19. 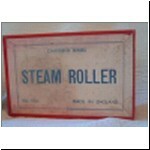 The firm was described as "manufacturers and designers of metal and electro-plated novelties and die-casters". 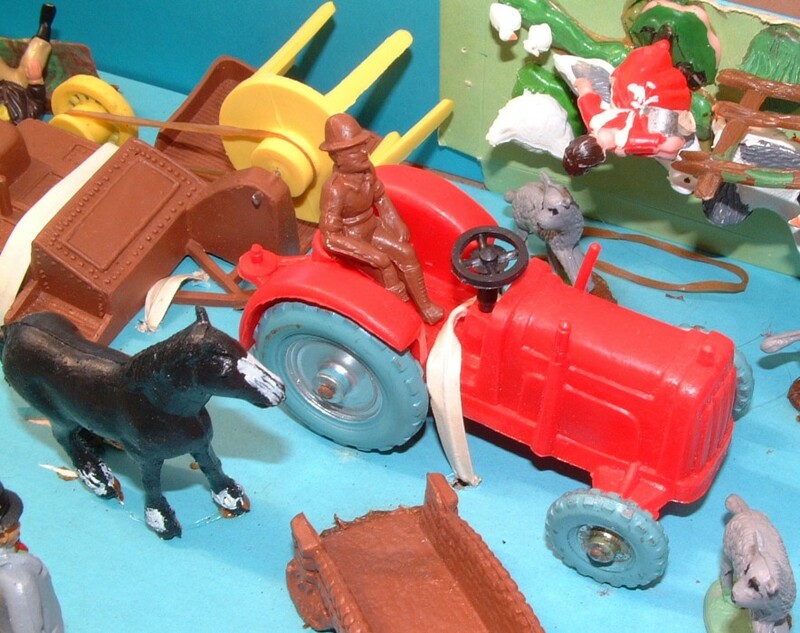 Mention was made of various lead toys, all of which were in the category of farm scenes rather than military figures, and included not only figures and animals, but a windmill, bridge, trees, and the start of the vehicle series in the form of a horse and roller. 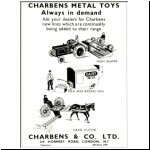 Charbens advertised again in 1929, when their address had changed to Andover Yard, 219 Hornsey Road, Holloway, N7, just a short distance away from Mitford Road. These premises were to be the Charbens factory for over 40 years. 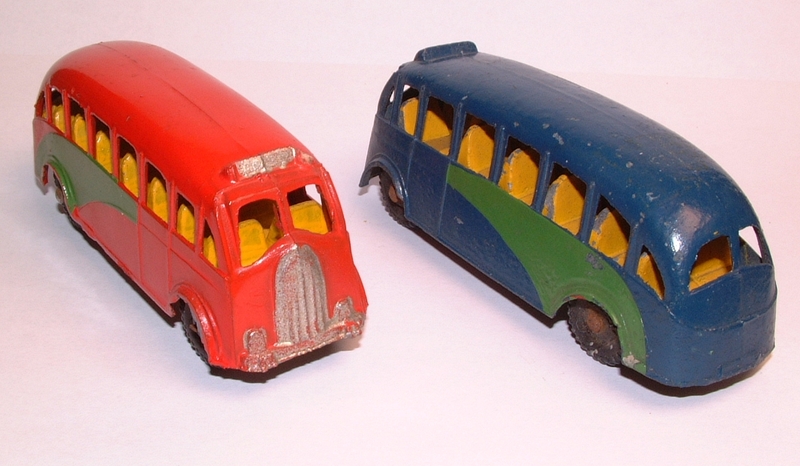 Lead figures (and later plastic) were the mainstay of Charbens production and the vehicles were always something of a secondary line. I am going to jump forward in time to look at their post-war items, but the pre-war vehicles will be the subject of a later article. 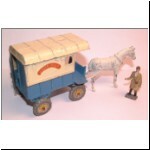 Suffice it to say that pre-war the vehicles were made of lead and consisted of quite a small range of disparate items. 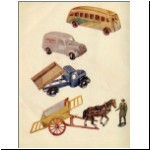 There is an undated pre-war Charbens catalogue which has survived, from around 1938, and shows many of the lead vehicles. 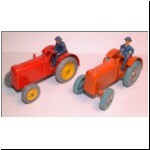 There does seem to be a clear divide between the pre-war lead production and post-war zinc diecastings. 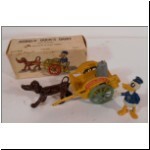 I can find no evidence that any of the pre-war motor vehicles were reissued after the war, or that any of the zinc toys appeared before the war. 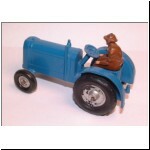 There were also some wartime versions of the vehicles made in plaster! 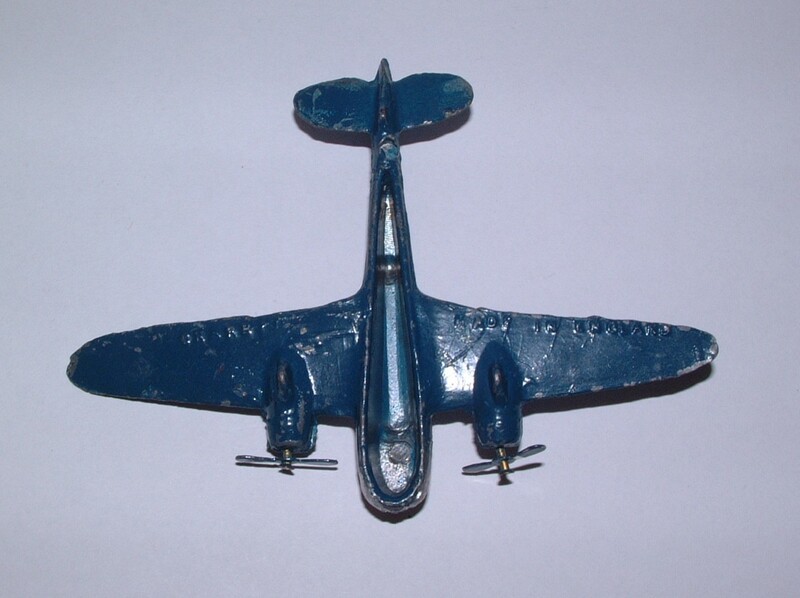 The change from lead to zinc was, I think, not just a change of material but a complete change in casting method. 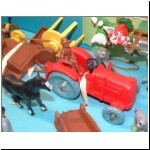 The lead vehicles were slush cast, like hollow cast figures, using hand-held gravity filled moulds, while the zinc toys were cast under pressure using diecasting machines. 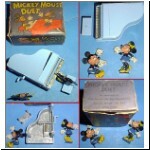 This meant that completely new moulds were required to change over from lead to zinc, and the opportunity was usually taken to change the design, even where a similar toy was to be produced by the new method. Charbens & Co.Ltd. was incorporated as a limited company on 7 October 1943, owned equally by Charles and Ben Reid. They had clearly done well enough in the 1930s by following on Britains' coat tails, such that they were able to move out of London, and in the Companies House records both brothers gave their address in 1943 as "Hillside", Vineyards Road, Northaw, Herts. (near Potters Bar). Ben Reid was still at this address in the 1984 phone book, so I wrote to him to try and find out something about the company history. I was disappointed that he never replied, but I didn't realise at the time that he was 93 years old, and maybe was not in a position to answer questions from a bothersome toy collector. 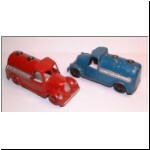 I should also mention the series of Matchbox size models, mostly veteran cars, known variously as the Old Crocks or Old Timers series. 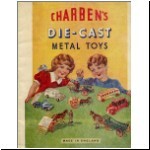 These were introduced in 1955 and continued to the end of Charbens production of metal toys around 1967. I covered these in an article some years ago (Model Collector, Vol.4 no.4 May 1990), and intend to update this by means of a separate article on the series for Diecast Collector readers. 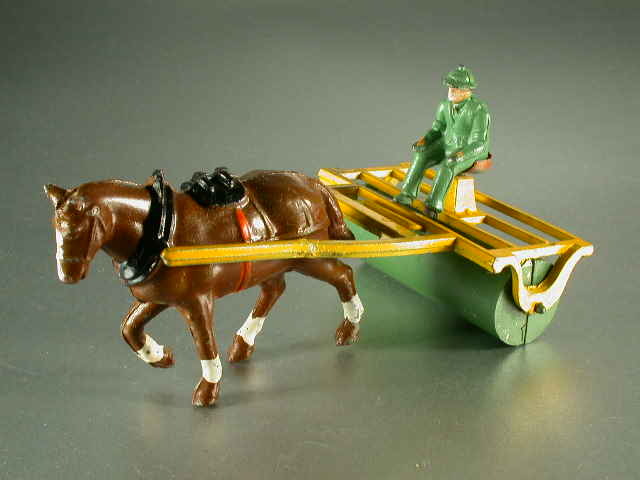 Plastic figures featured increasingly in the Charbens range, both for cost and safety reasons, and plastic parts were also incorporated in many of the diecast toys in the 1960s, in fact some models were produced completely in plastic. 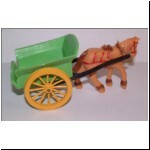 Many of the moulds for the plastic items have survived, and reproductions are being made by Plastics from the Past*. 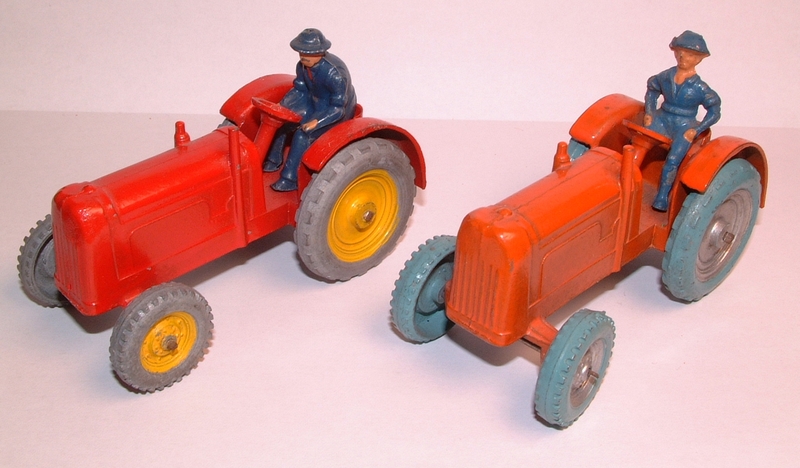 The only vehicles that have been reproduced are the plastic Farm Wagon (see no.4) and Armoured Car (see no.26). 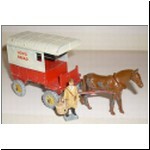 Ben Reid sold the company in the late 1960s and diecast toy production ceased around 1967. 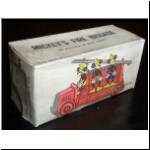 A few diecast items were still listed in 1968 in boxed sets. 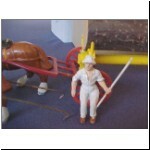 Plastic figure production continued till around 1974 when the Hornsey Road premises were compulsorily purchased by the London Borough of Islington for redevelopment. 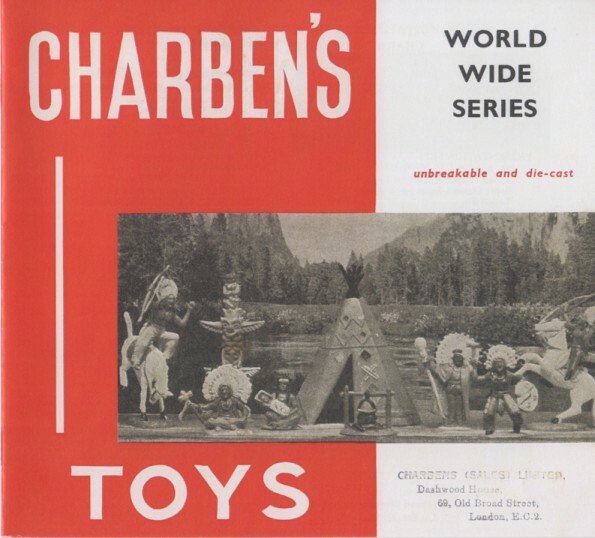 The company moved to Biggleswade, Bedfordshire, and subsequently the Charbens brand name was used for craft toys such as knitting, sewing and tapestry sets! 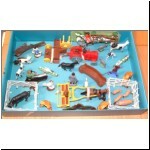 Charbens boxes can be very diverse thanks to the long period of production of many of the toys. 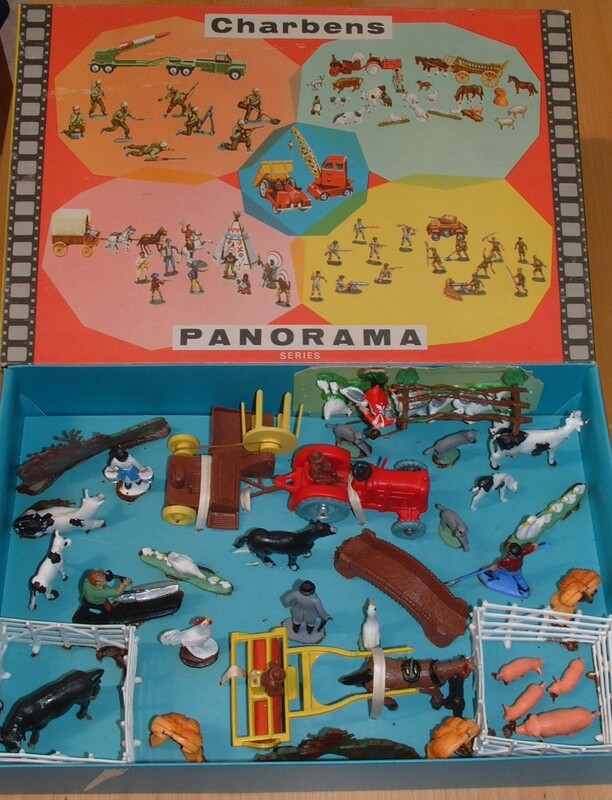 Most of the larger vehicles were individually boxed, while the others were packed in half dozens. 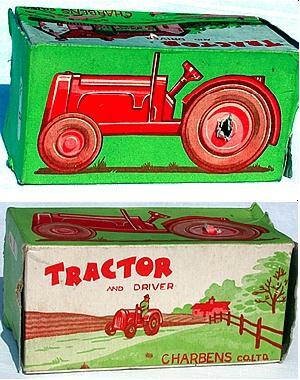 Individual boxes for pre-war toys were usually of the lift-off lid style, with a paper label and often no mention of the Charbens name. 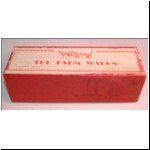 Post war boxes continued in the same style but usually with the Charbens name mentioned, and often made of cheap quality card. 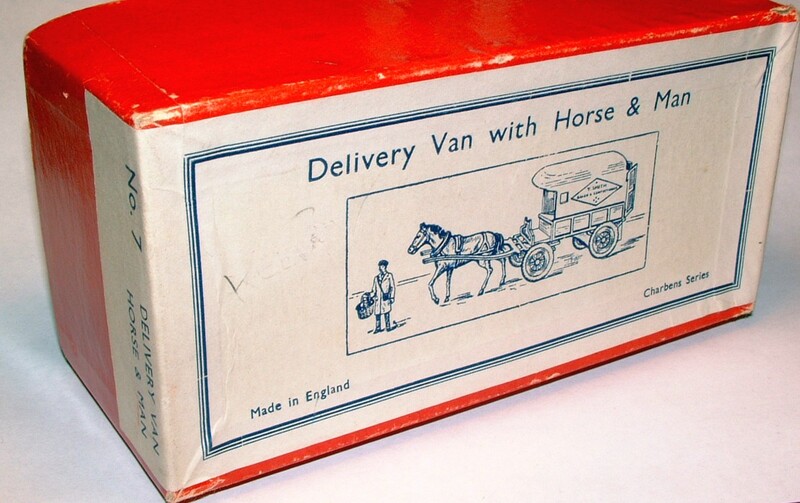 Moving into the 1950s, better quality boxes appeared with the card covered in coloured paper. 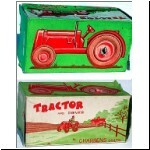 More colourful printed cartons appeared in the late 1950s, replacing many of the lift-off lid boxes. 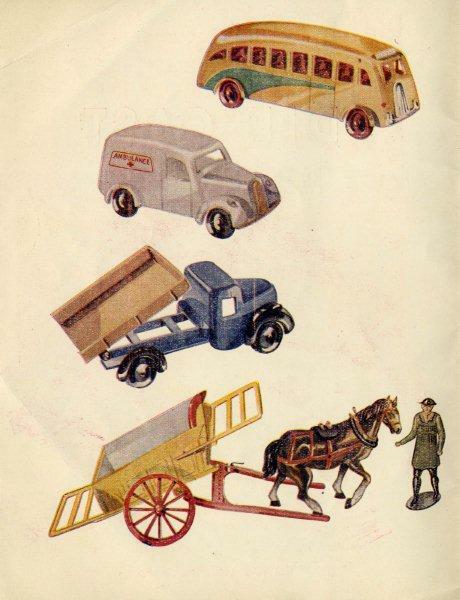 Dating of the post-war toys has only really been possible thanks to a series of photocopied catalogues in my possession. 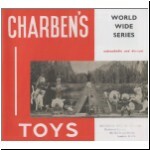 The originals of these catalogues were the Charbens factory copies, and the late Jim Mills (who ran the London Toy and Model Collectors Club for many years) had spoken to someone at Charbens, made a few notes about the company history, and had taken copies of the catalogues. This must have been some time in the 1970s or early 1980s. Jim gave Vic Davey copies of the photocopies, and Vic in turn gave me copies of his photocopies, so at fourth hand the quality is now pretty poor! 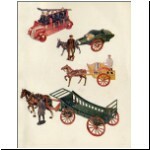 I wonder whether the factory originals of these catalogues survived? If you know their whereabouts, please e-mail me or write to the editor. The colour cover and inside pages shown here are from the 1955 catalogue, and the cover was also used for 1957 and 1958 (reproduced courtesy of Norman Joplin and Philip Dean). 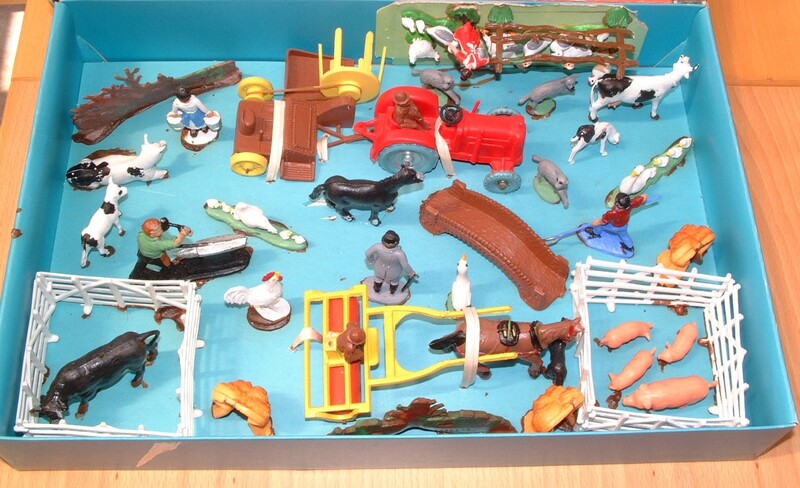 There was also a good quality reproduction of the 1960 catalogue with a green card cover, produced in 1977, and these can still be found at toy fairs from time to time. The last proper catalogue I have is undated, but is approximately from 1962. 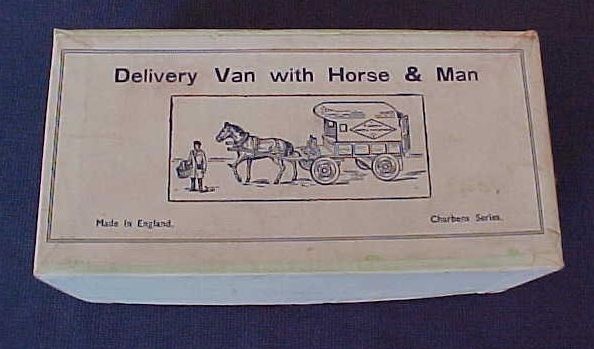 A reproduction of this catalogue has been produced recently (in 2015). After that, I have typewritten price lists for 1967 and 1968 as well as a USA export list for 1967. Where I have shown a model as discontinued in 1962, it may in fact have carried on for a little longer, but was certainly gone by 1967. Can anyone add to this number series? Then, among the factory catalogues is another 1953 catalogue with hand written amendments and catalogue numbers added, starting at no.1. Most of the post-war vehicles were included somewhere in the new numbering sequence, but three models seem to have been discontinued before 1953, so I will describe them first. Charbens made a petrol tanker both before and after the war, but they are entirely different models. 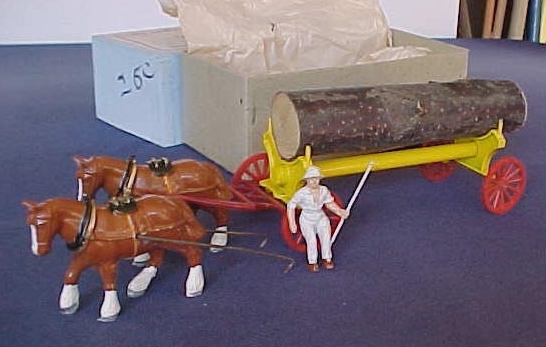 The pre-war tanker was a lead slush casting and is one of the more common pre-war Charbens items (see the pre-war article). 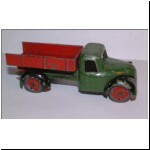 The post-war tanker was a one-piece zinc diecasting and very crudely modelled - it doesn't really look anything like a real make of truck. CHARBENS MADE IN ENGLAND was cast underneath. 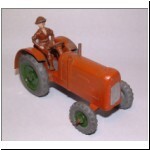 The model was fitted with a standard type of diecast wheel/tyre, found on very many of the post-war vehicles. The earliest of these wheels had plain hubs (as on the red tanker illustrated), but then some decoration was added in the form of star points around the hub, alternating with wheel nut heads. 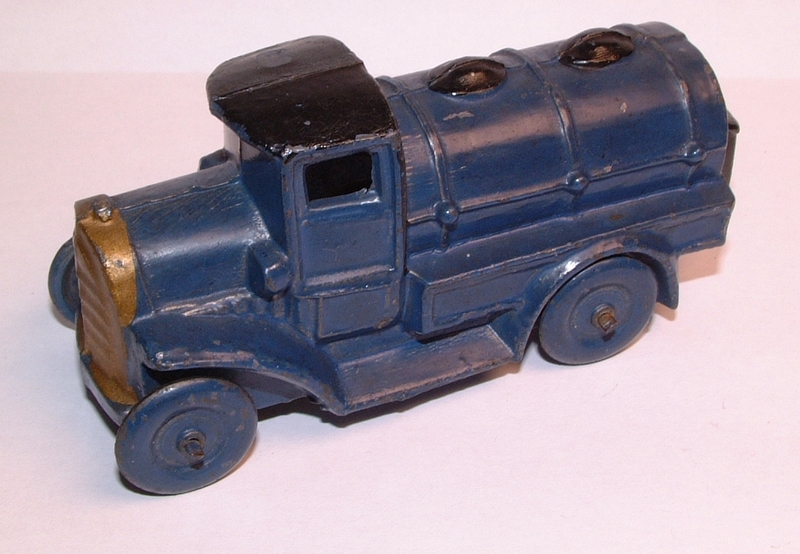 The blue tanker illustrated has the later wheels. 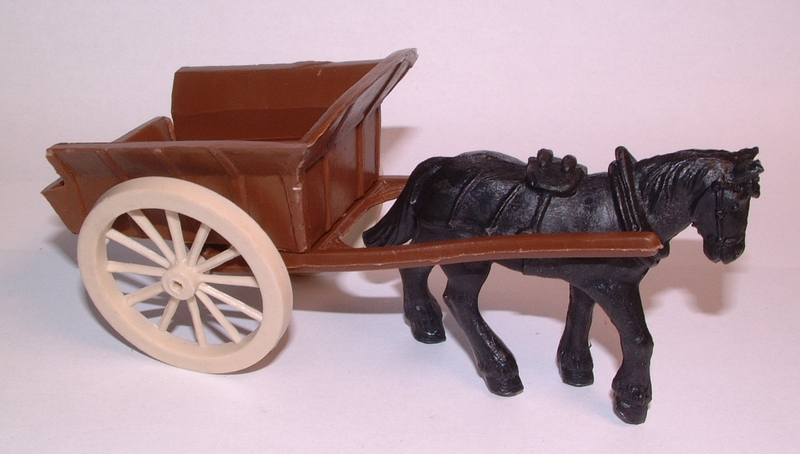 The model was spray painted after assembly of the wheels and axles, and then silver and black trim was added by hand. Generally the trim paint was applied in a consistent way, but the blue tanker has black trim on the wheels, which is absent on the red tanker. I don't propose to comment on minor trim or casting variations on the models. Like most Charbens zinc castings, the tanker can suffer from metal fatigue. The dreaded fatigue is caused by impurities such as lead in the zinc alloy. 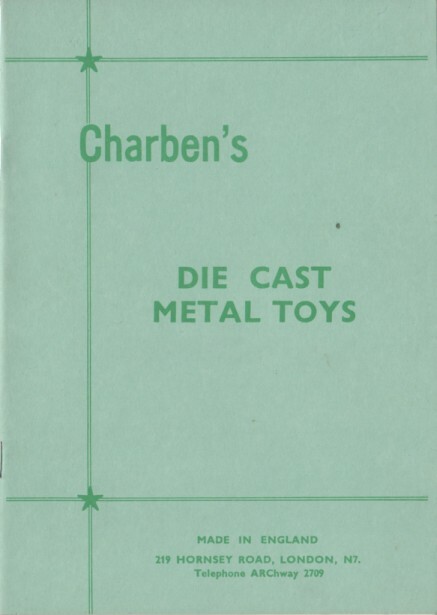 Charbens continued to use lead for their hollow cast figures alongside zinc diecasting, so it is not all that surprising that some lead contamination got into the molten zinc, but fatigue is so prevalent in Charbens production through the 1940s and 1950s that it is clear they didn't care very much about the quality of their product. Things improved a little in the 1960s (if only because lead production was phased out!) and the last of the Charbens diecasts usually have sound metal. 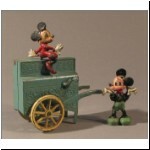 The tanker is not a common toy, but is not too rare either, unlike the next two items which are both very scarce. 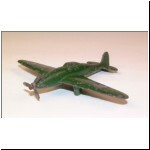 This model was just as crude as the tanker, but I think is also charming in a way the tanker was not. 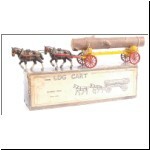 It is somehow evocative of a big station wagon of the period, even though the typical wood frame is not represented in the model - this must be a steel bodied version! I have spent some time trying to attribute the model to a particular make of car, without success, and it does just seem to be a generic design. 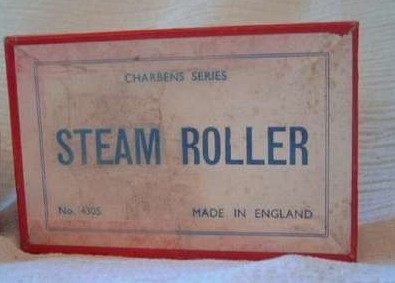 CHARBENS MADE IN ENGLAND was cast under the roof. 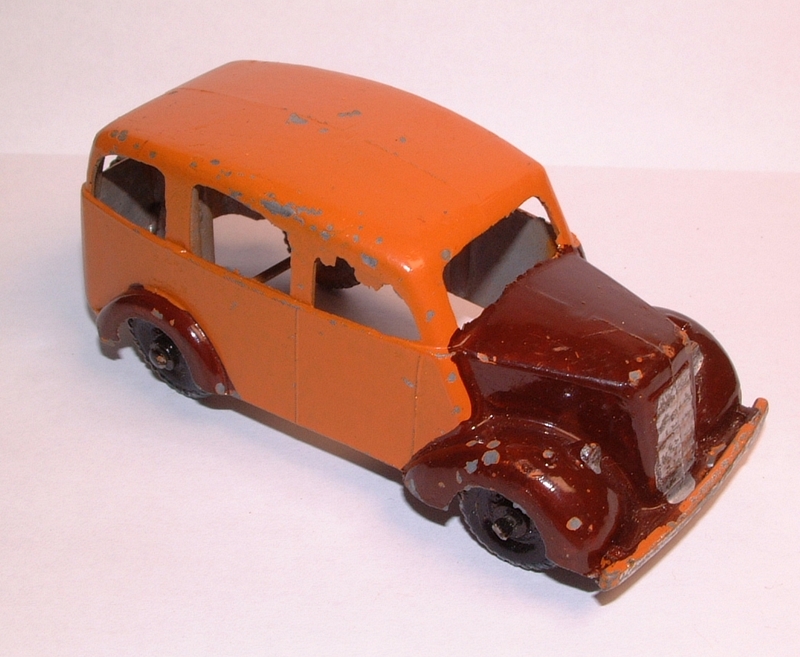 All those that I have seen have had the same colour scheme, where the basic model was sprayed in an orange-brown colour (including the wheels) and then hand painted trim was added in dark brown, silver, and black for the wheels. A nice touch was the separate spare wheel secured to the rear doors. Rare and desirable. I have to put the name Javelin in quotes, because while this model does have JAVELIN cast under the bonnet, it is really too long and low to be a Jowett Javelin, and in fact is more plausibly a 1942-47 Packard, particularly looking at the grille. 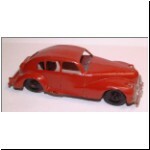 It is remarkable how many of the small diecast toy makers made a Packard-like saloon, and there are similar toys from Kembo, Betal and Kemlows (the latter is unmarked, the others have the maker's name on them). 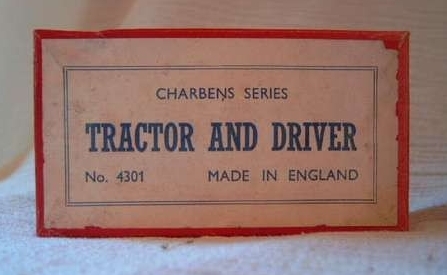 As well as the JAVELIN name, the Charbens model had CHARBENS MADE IN ENGLAND cast under the roof. 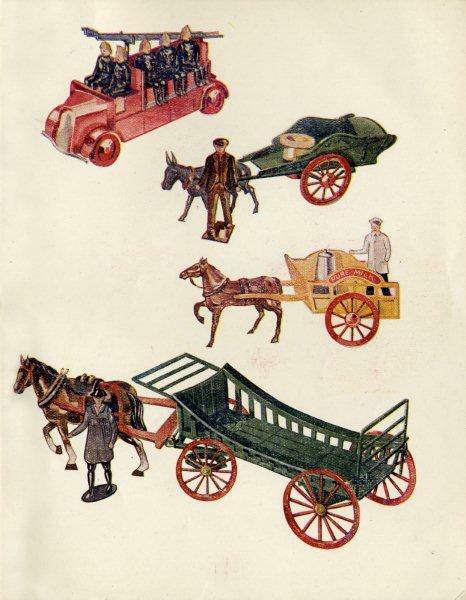 Basic colours were red or green, with silver trim and black overpaint on the standard type of wheels. Just as rare as the Station Wagon, but not quite so desirable in my view. The original article did not include these two rather crude lead aeroplanes, but as I included the pre-war plane it seems appropriate to mention them. 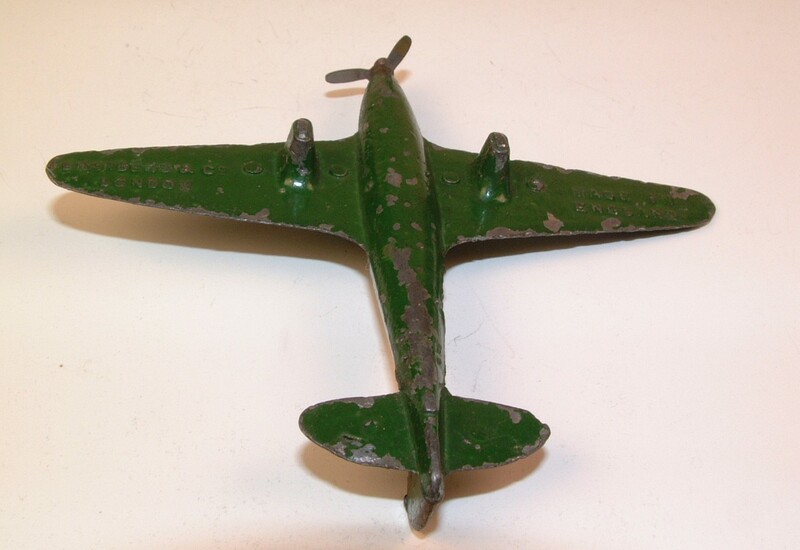 They are simple lead castings with tinplate props and are not particularly rare. CHARBENS and MADE IN ENGLAND cast underneath. 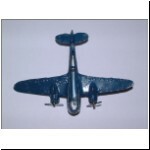 Paper RAF roundels on each wing. Colours: dark blue or green. CHARBENS & CO. LONDON and MADE IN ENGLAND cast underneath. Star in circle transfers on each wing. Colours: dark green, dark red or blue. 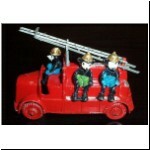 Fire Engine with two piece ladder and ladder support (see no.40), three Mickey Mouse firemen. 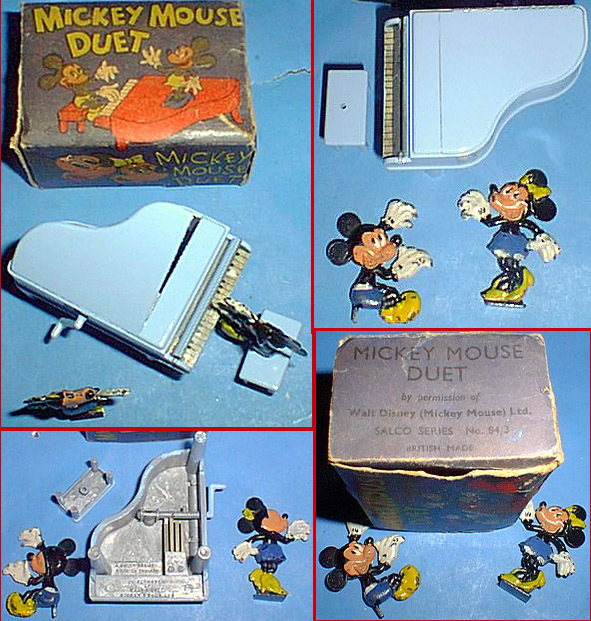 Diecast piano which plays a tune, piano stool with seated Mickey Mouse playing, Minnie Mouse figure singing. 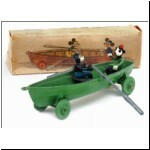 Diecast rowing boat with wheels (! 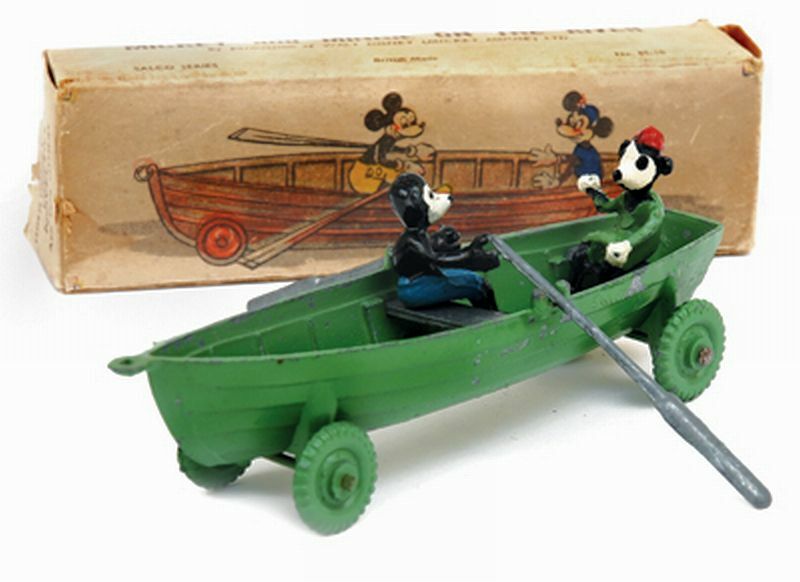 ), two oars, Mickey rowing and Minnie seated figures. 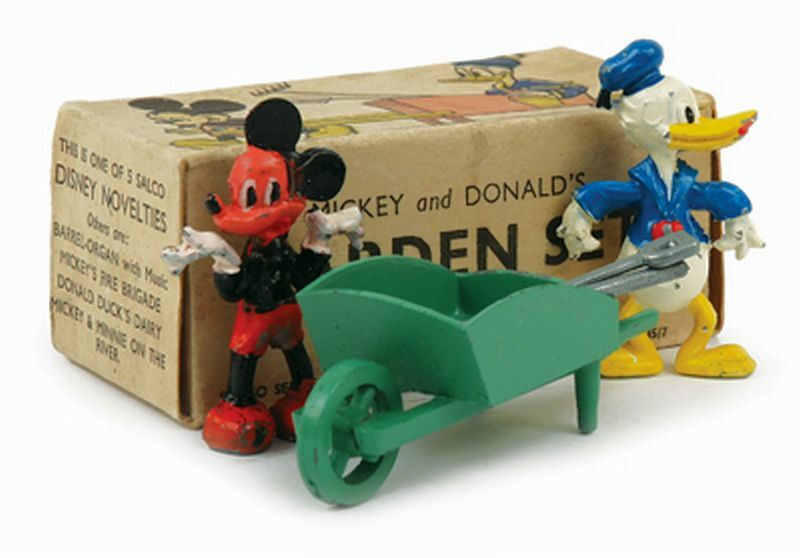 Diecast wheelbarrow, Mickey Mouse and Donald Duck figures, spade and rake. 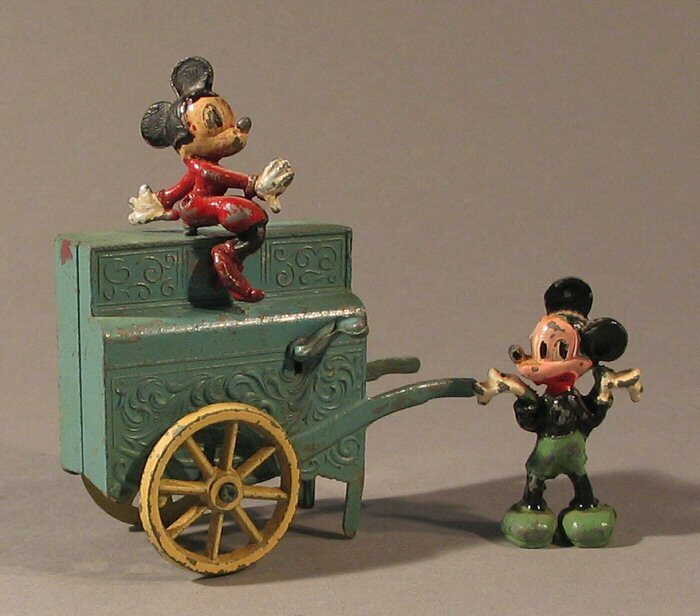 Diecast barrel organ (plays a tune), figures of Mickey standing and Minnie seated on top. 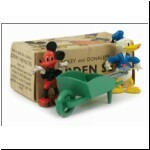 Diecast cart with PURE MILK labels (see no.25), diecast milk churn, figures of Pluto pulling the cart and Donald Duck driving. 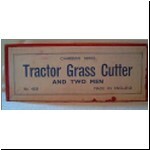 Length about 340mm, late 1940s to 1960, individually boxed. 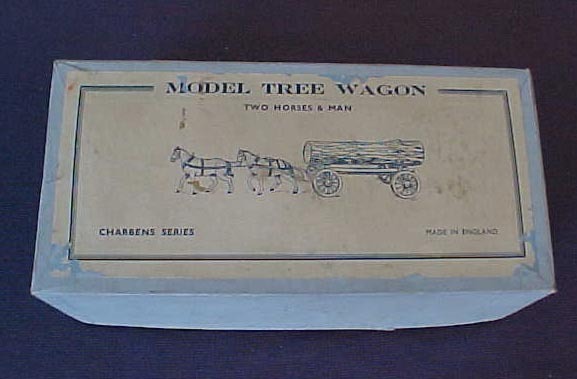 The pre-war tree wagon had a wood dowel as the main chassis member of the trailer, and other components in lead (see the pre-war article). 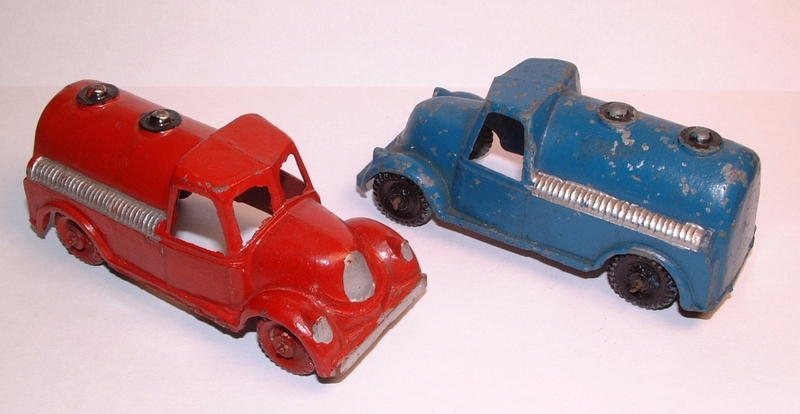 Early post-war models were zinc diecastings with a square section diecast chassis member, having a series of holes to make it adjustable for length. The horses were also zinc, cast in two halves. 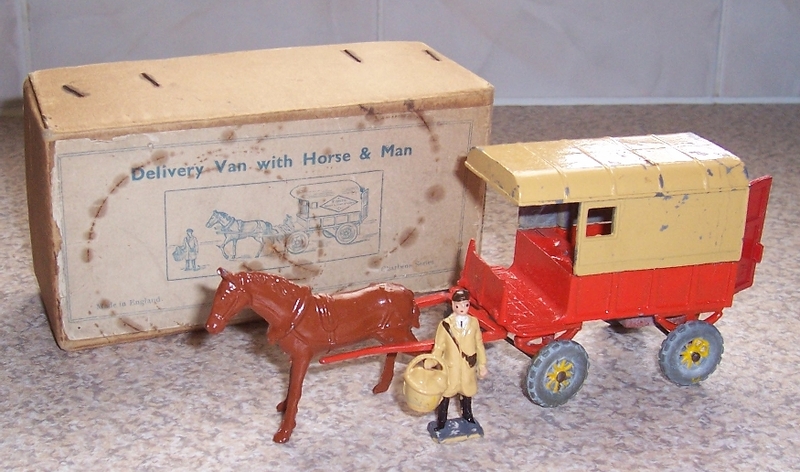 This is the version in the second photo pictured here with its box. 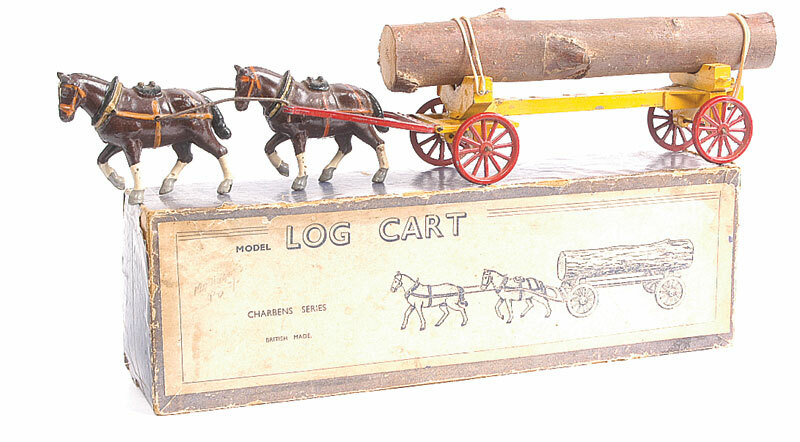 Two lead figures, one walking and one seated, were supplied with some of these early models, but by the 1953 catalogue the tree wagon was listed as having only one man. The log was of course a real piece of branch from a tree or bush. 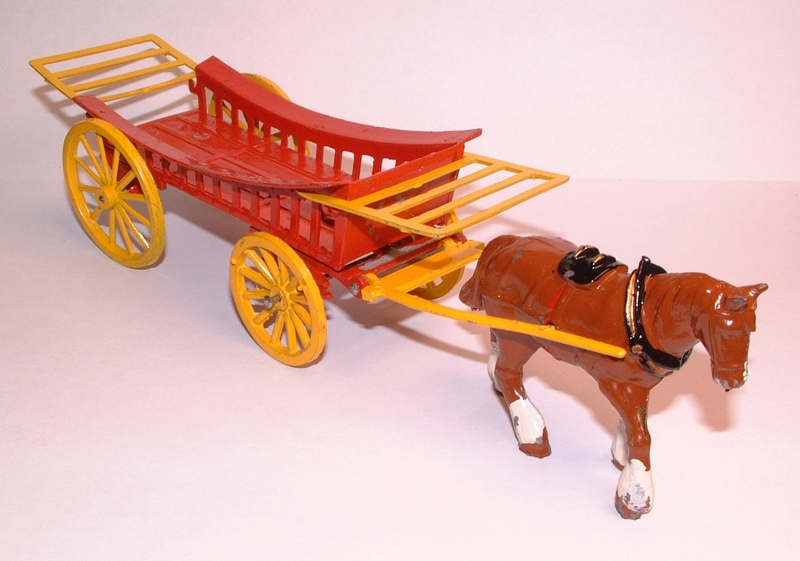 Later a revised wagon appeared, reviving a wood dowel for the chassis member, with thinner and lighter bolsters under the load, and simplified shafts which hinged on the same axle as the wheels. The front end bolster usually had CHARBENS MADE IN ENGLAND cast. 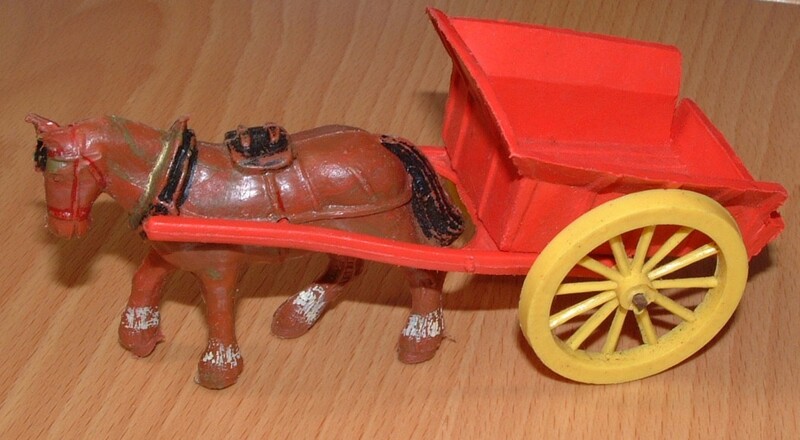 The bolsters, shafts and wheels were again zinc castings, but a new hollow cast lead horse was introduced, with thicker legs and shaggy feet, often painted a lighter brown (shown in the third and fourth photos above). Transitional combinations of components exist between the early and later post-war versions. The post-war version with a dowel chassis is often mis-described as a pre-war model because of this feature, however it is not at all rare. 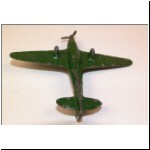 Genuine pre-war models have distinctive heavy hollow cast lead bolsters which are easily recognised. 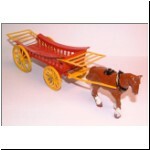 Colours for the tree wagon always seem to be a yellow wagon, dark red or yellow shafts, dark red wheels, brown horses and white man. 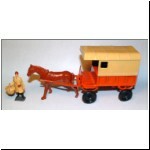 After 1960, the two-horse tree wagon was discontinued, but the model remained in production as no.35 (one horse tree wagon). 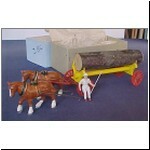 See also no.17 (tractor and tree wagon). 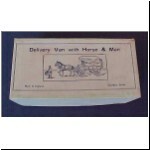 Late 1940s to 1967, individually boxed. 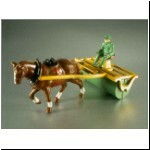 (1) Yellow with green diecast roller, red seat, brown horse. 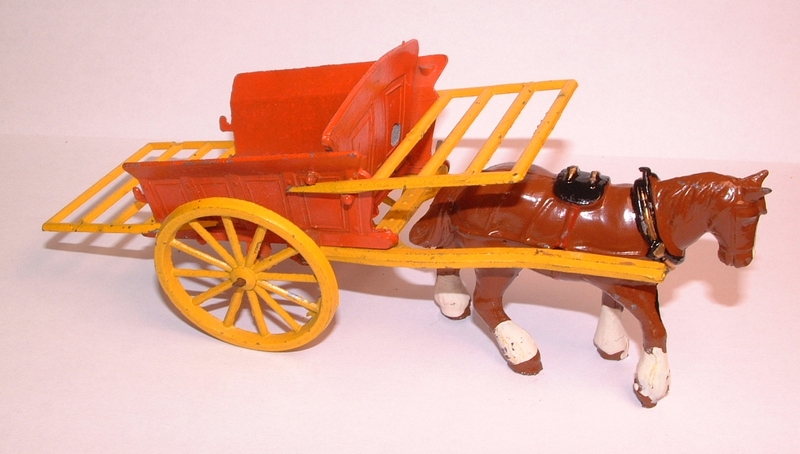 (2) Yellow with red wooden roller, brown plastic horse, seat and man. For a photo, see the boxed set pictured below under no.6. 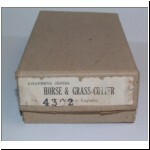 Length 146mm, about 1950 to 1967, individually boxed. This was a new model post-war, and was illustrated in a Charbens advertisement in Games & Toys, February 1950. 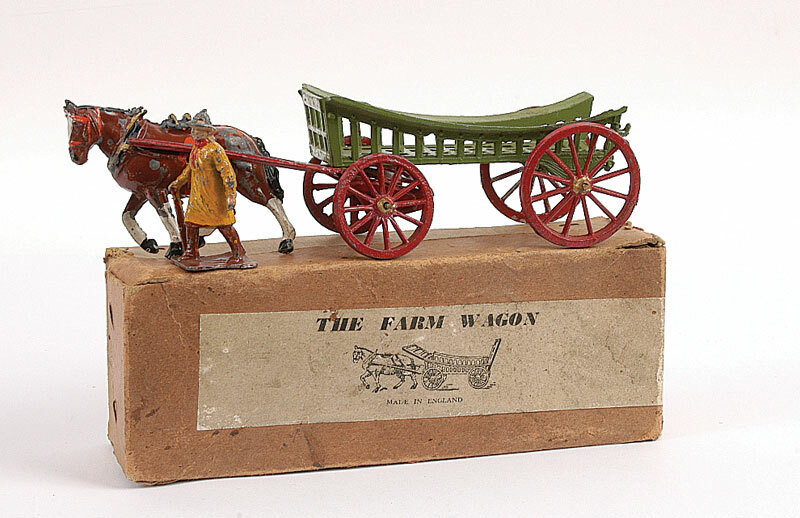 The wheels were attached directly to the body of the machine without a separate axle, while the shafts were separately cast so that an alternative version pulled by the farm tractor could be made (no.18). The horse was the same as no.1. With or without CHARBENS MADE IN ENGLAND cast underneath. 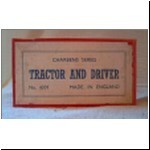 For details of the man, see no.6 (tractor). 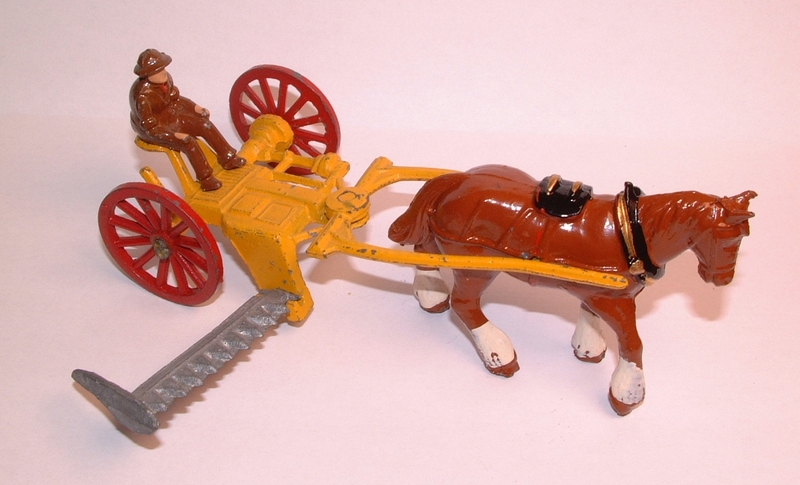 Despite its long run in the catalogue, the grass cutter does seem to be a rare item. 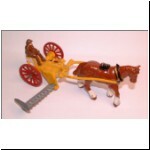 Colours: yellow with red wheels, brown horse, unpainted or metallic gold cutter blade. (1) Green wagon, yellow shafts, raves and wheels. 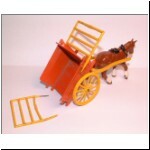 (2) Orange wagon, yellow shafts, raves and wheels. Brown horse and yellow man. 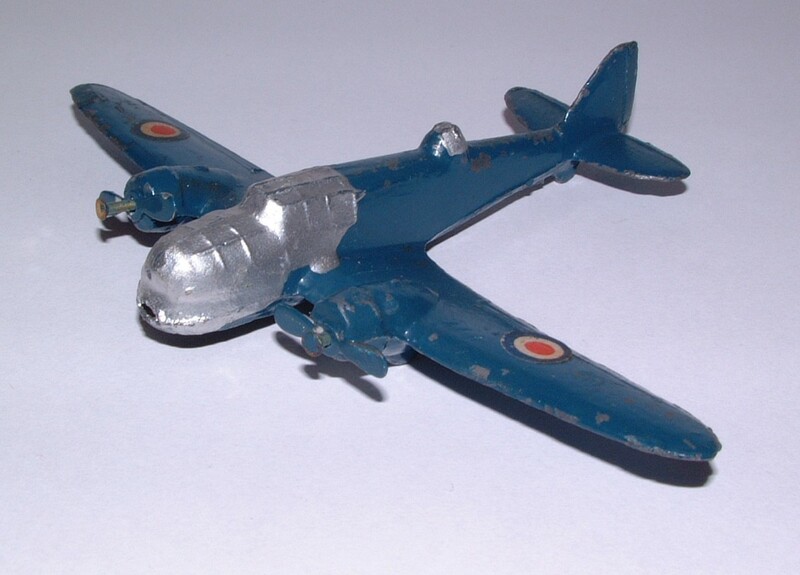 There was also an all-plastic version, marked only MADE IN ENGLAND underneath. 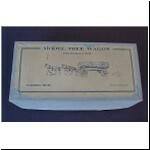 This has been reissued from the original moulds by Plastics from the Past*. 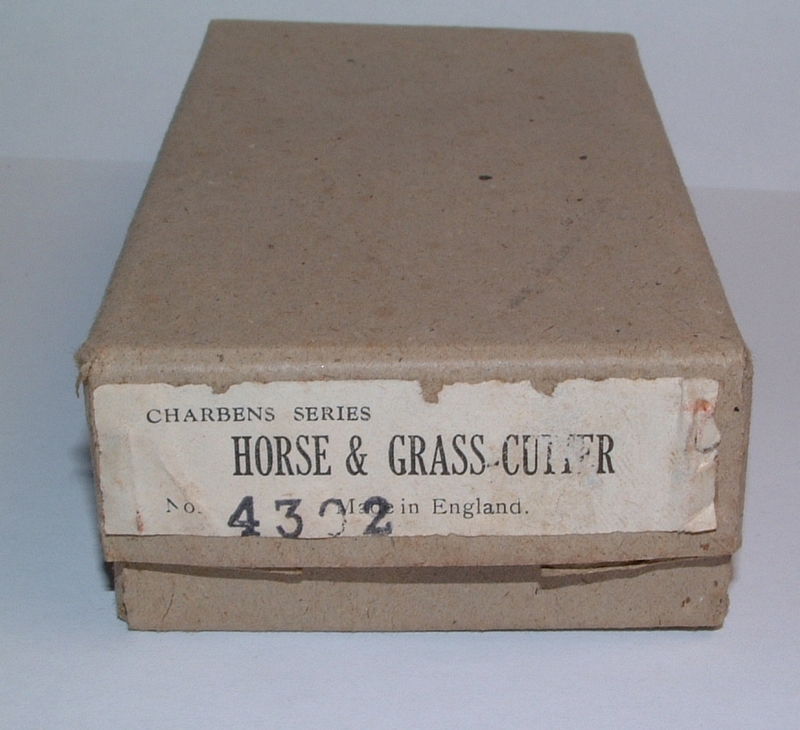 Length 235mm, late 1940s to 1967, individually boxed. 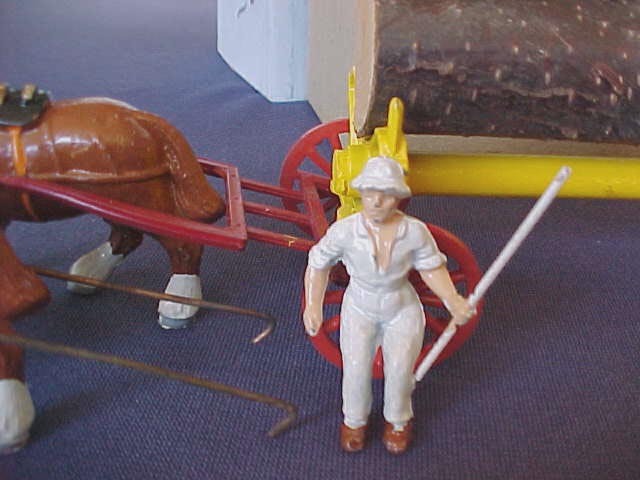 (1) Dark green wagon with red or yellow raves, shafts and wheels, brown horse. 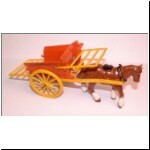 (2) Red or orange wagon with yellow raves, shafts and wheels, brown horse. 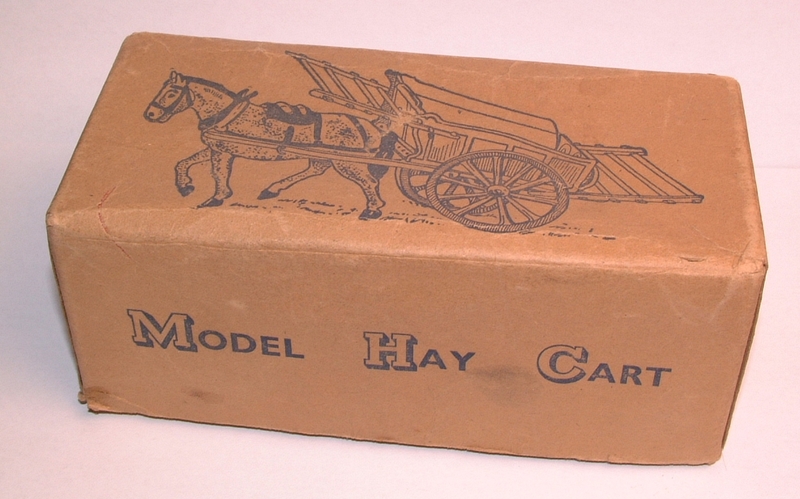 Length 91mm, late 1940s to 1967, boxed in half dozens till 1960, then individually boxed. 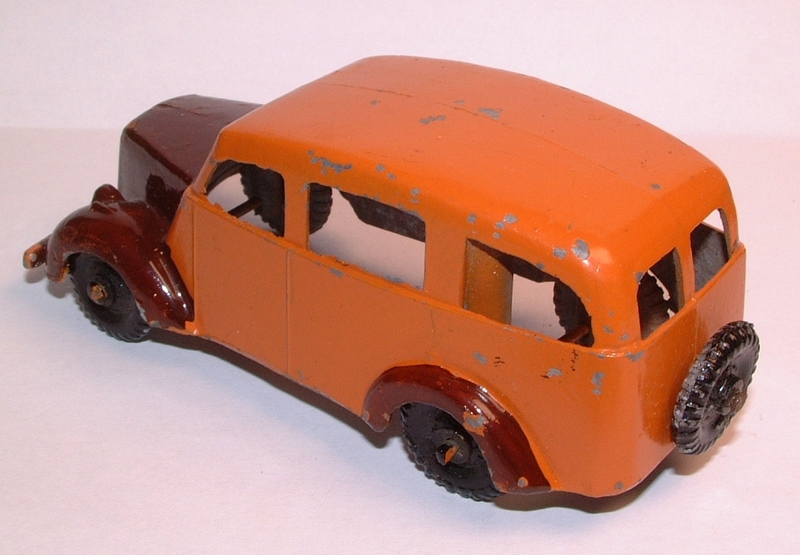 (1) Orange body with silver trim on grille, unpainted metal wheels with green hubs. Front wheels are fully three-dimensional with no difference between the inner and outer face. 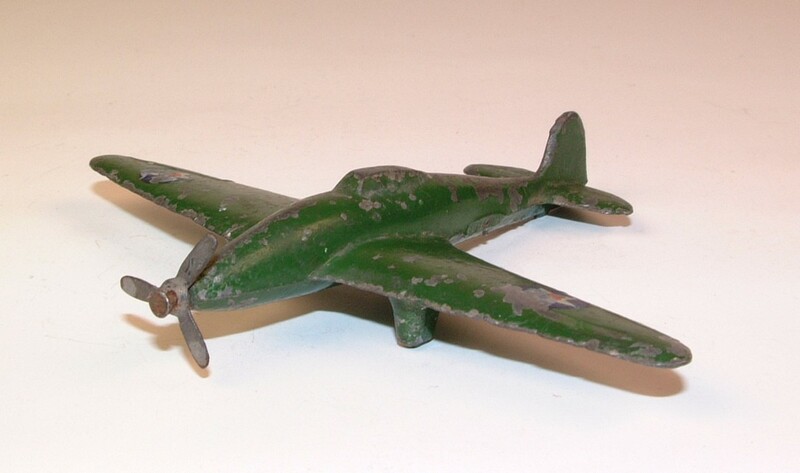 No identification cast on the model. 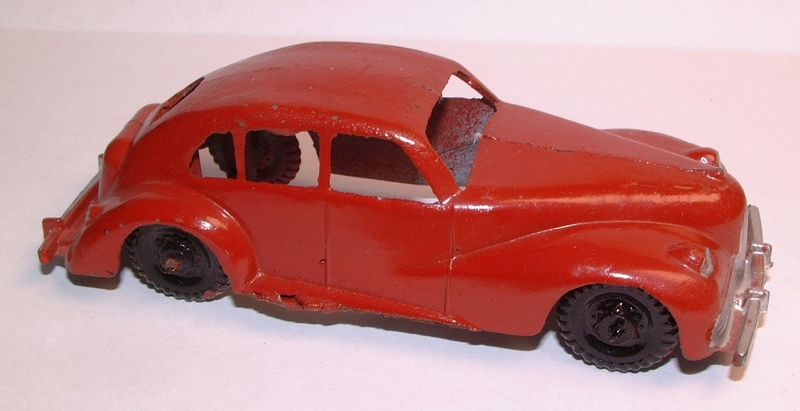 (2) Red body, no trim, unpainted metal wheels with green or yellow hubs. Front wheels have no detail on the inner face. 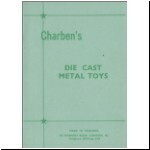 The die appears to have a new core, making the whole casting thinner and lighter, with CHARBENS and MADE IN ENGLAND cast underneath. (3) Blue body, black solid rubber wheels with silver hubs. The bonnet has been thickened again, removing the CHARBENS name, but MADE IN ENGLAND remains. 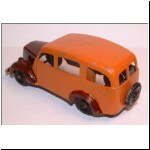 (4) Orange body, light blue wheels with silver hubs, same casting as (3), metal or plastic wheels. 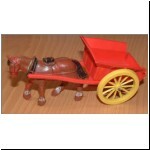 (5) Red plastic body, light blue metal wheels, front wheels revert to the same casting as (1). 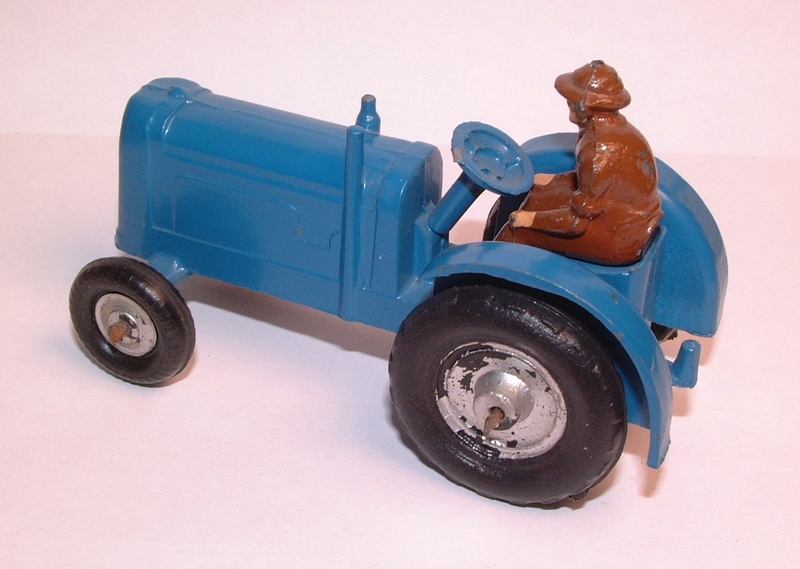 The tractor is one of the most common Charbens vehicles, but the blue version is exceptionally rare. 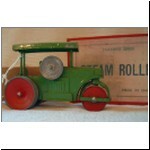 The rubber wheels on the front axle are the same as found on the racing cars (nos.32 to 34). 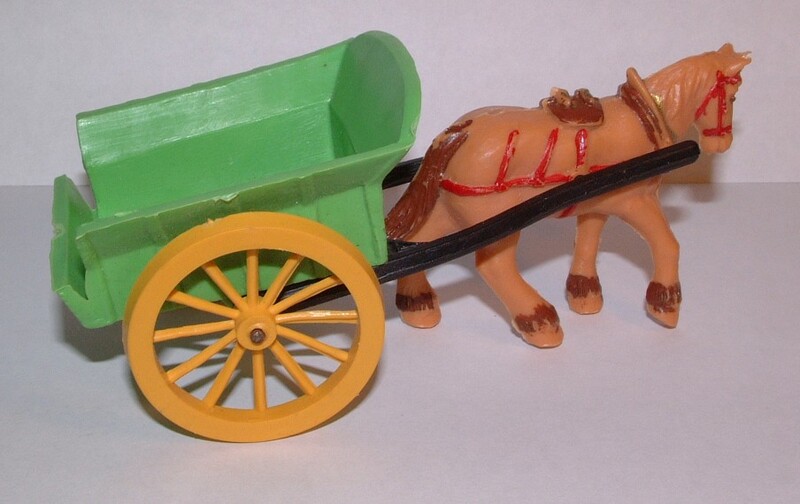 The last version in plastic is also rare and was from a new mould. 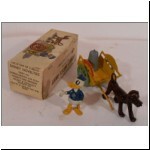 It is mentioned in the 1967 price list and the picture shows one in a boxed set. 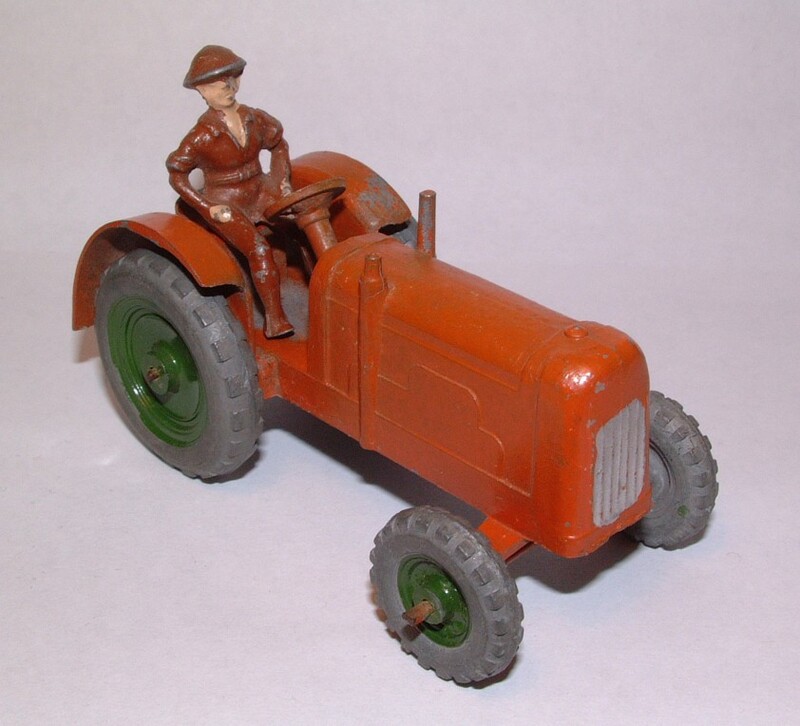 There are two basic types of tractor driver, one who sits hunched forwards with his back curved, and the other who is more upright with a straight back and legs apart. 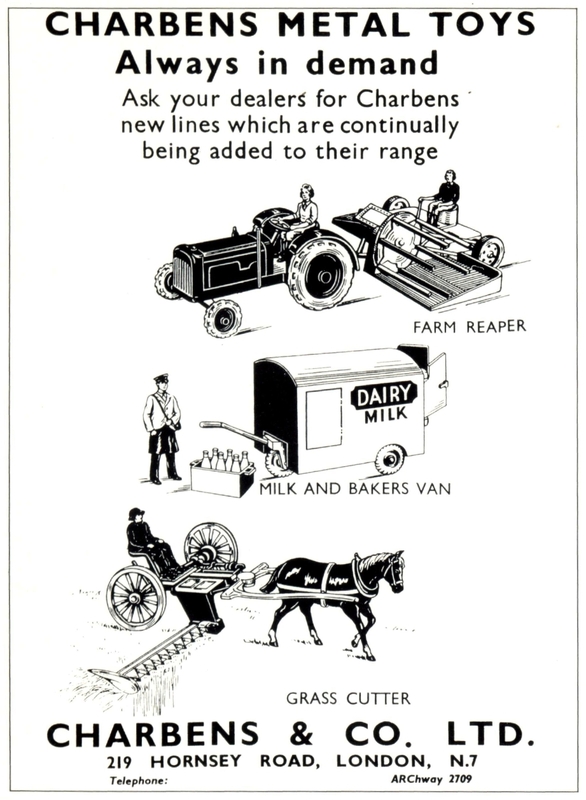 The catalogues show the curved back driver with the roller and grass cutter and the straight back driver with the tractor and reaper - but in practice the drivers seem to have been interchangeable. The curved back driver is usually hollow cast lead, although I have one which is a solid zinc casting. Colours: brown, yellow, green or blue. The straight back driver is usually zinc, often fatiguing, and was also made in plastic. 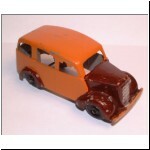 The metal version was painted brown or blue, and the plastic driver was brown or black. The plastic driver has been reissued by Plastics from the Past*. 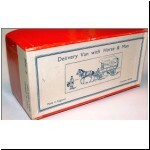 Length 150mm, late 1940s to 1962, individually boxed. 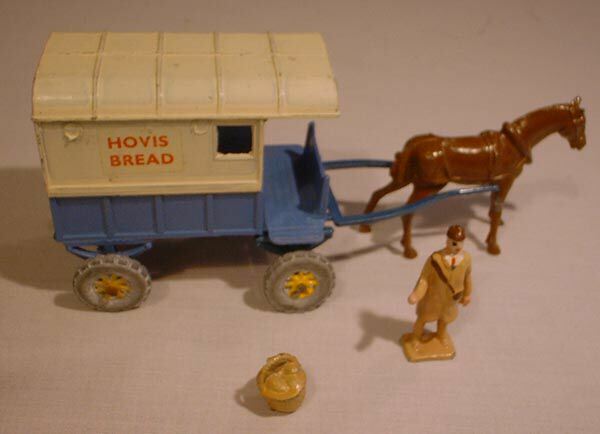 (1) Blue shafts, lower body and rear doors, cream upper body, metal wheels of a unique design with yellow painted spokes, HOVIS BREAD transfers or PURE MILK labels (as on no.25). 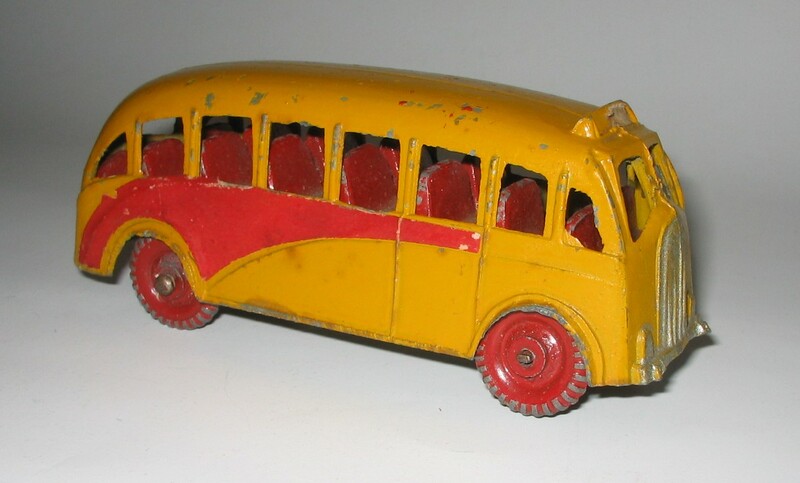 (2) Orange shafts, lower body and rear doors, cream or light brown upper body, spoked metal or solid rubber wheels, with or without HOVIS BREAD transfers. 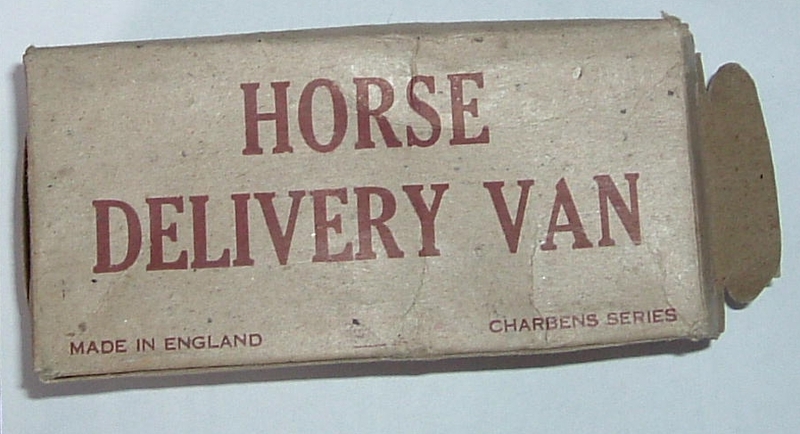 CHARBENS MADE IN ENGLAND was cast underneath the van, and MADE IN ENGLAND under the rather skinny horse. 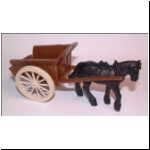 The horse was painted white or brown, and the set was completed by a figure of a delivery man and separate basket of loaves. The PURE MILK version is a bit of an oddity and may have been a factory error or a short run expedient when stocks of the HOVIS BREAD transfers ran out. 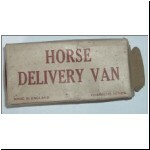 Length 109mm, 1946 or 1947 to 1962, boxed in half dozens. 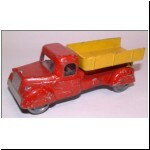 Rather crude and not modelled on any particular make of truck. Earlier models had CHARBENS MADE IN ENGLAND under the cab roof, later just MADE IN ENGLAND under the bonnet. 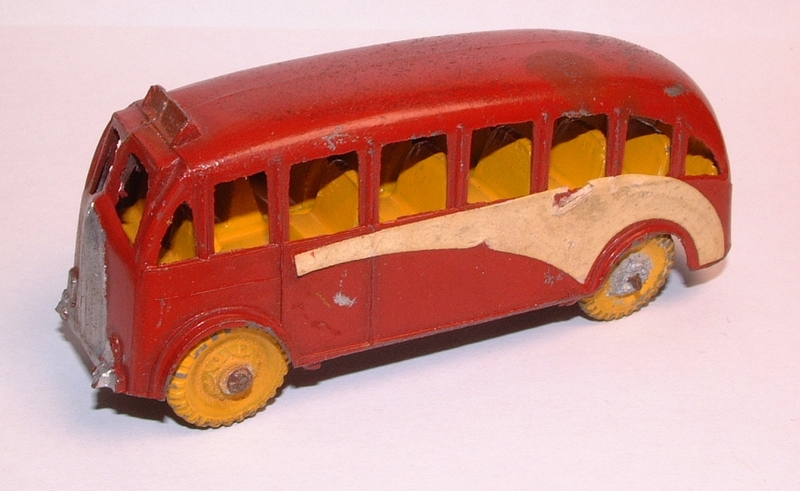 Through most of its life, the model had black painted front and rear mudguards. 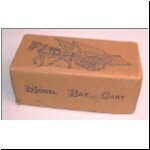 Early wheels were the pre-war standard type (see the pre-war article), suggesting that this model was an early post-war introduction. They were quickly replaced by the standard Charbens wheels. 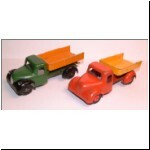 Colours: dark green, red or blue cab/chassis with red, yellow or cream tipper. The last version had a new style of plastic wheels with treaded rubber tyres and no black trim on the mudguards. 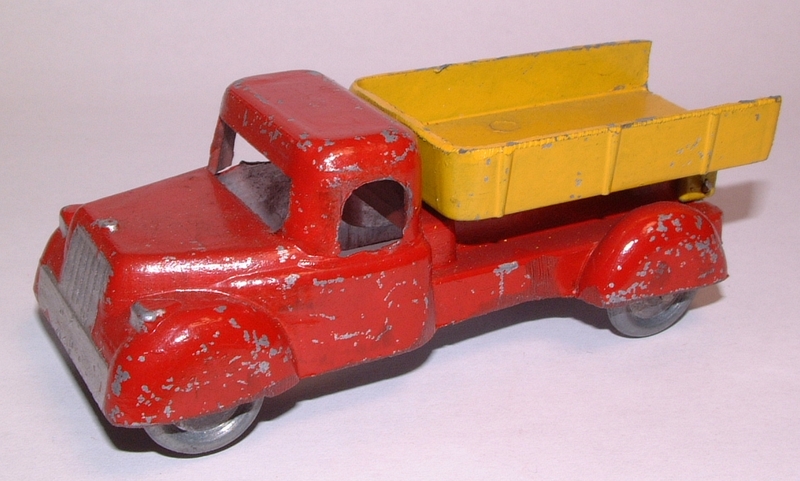 Colours of this version were orange cab/chassis with yellow tipper and red hubs. 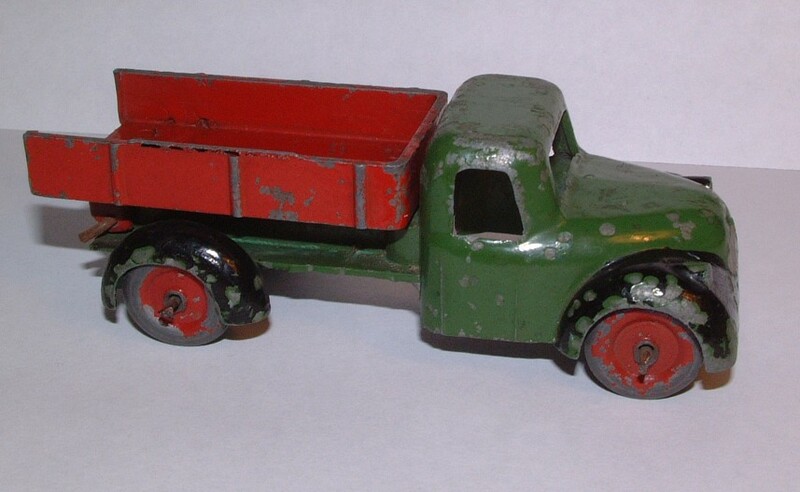 Also pictured is a copy of the Charbens tipper made by Agasee & Brooks Ltd. and advertised in 1948. This is such an obvious copy that it proves the Charbens model must have been issued in 1946 or 1947. I am researching Agasee & Brooks and their various other north London offshoots, and hope this will be the subject of a future article. 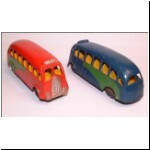 Length 104mm, late 1940s to 1962, boxed in half dozens. 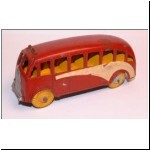 The booklet The World's Model Buses* suggests this is a model of a Midland Red coach. 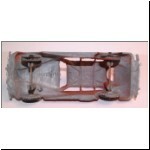 The baseplate and interior seats are a separate casting which just fits loosely into the body and is not held in place. This casting also includes the axle pillars. 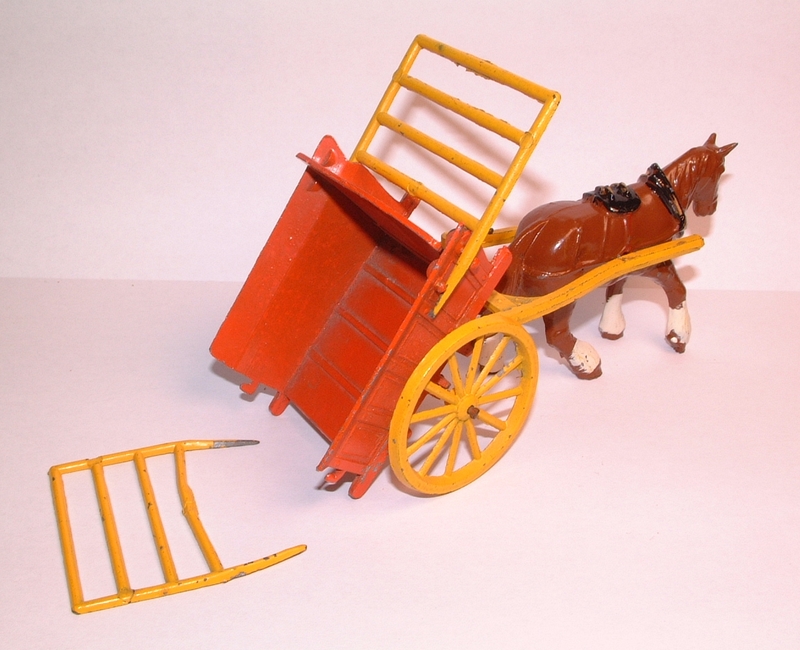 Wheels were usually the standard metal type, although an early version exists with metal hubs and rubber tyres. With or without CHARBENS MADE IN ENGLAND cast under the chassis. Earlier versions used a paper label for the body side flash! There was also a paper destination blind, and I have seen LONDON, YORK or DOVER destinations. Colours of this version were: Beige with green flash, yellow with red flash, dark red with cream flash. Seats were red or yellow. 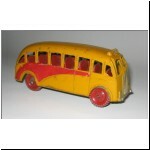 Later models had an even more crude hand painted side flash, and just silver trim on the destination board. Colours: dark blue with green flash, red with green flash, light green with blue flash. Yellow seats. Quite a hard model to find. The World's Model Buses, Pirate Models, 1970.